To accompany the real-world event programmes of the Hispanic festivals, expanding their scope through the use of digital tools, Hay Festival has teamedup with BBC Mundo for the preparation of a supplementary online programme in which Hay Festival Querétaro guests and other major figures in the world of European and American culture talk about current affairs, offer suggestions forbooks to read and authors they admire, and share their views on specificsubjects. Readers can also find notes of interest and test their knowledge ofliterature and the Spanish language. This digital programme, with exclusive online videos, texts, images andconversations, will be broadcast on the website of BBC Mundo and Hay Festival from 4 September onwards. Hay Festival and the British Council signed a global alliance agreement at the 2010 Hay-on-Wye Festival and since then they have worked together to support the presence of writers and thinkers from the United Kingdom in front of foreign audiences around the world. The literature team of the British Council promotes British publishers, poets, writers and opinion leaders to different communities and audiences all over the world, carrying out innovative, high-quality events that promote dialogue and cultural exchange between the United Kingdom and the rest of the world, and which take contemporary British writing and literature, in all its vibrancy, to an international public. With more than 75 years of experience in Mexico, the British Council works building cultural and educational relations that allow mutual understanding and trust among nations. Elipsis is the British Council in México’s literary program that offers support andnew opportunities to young Mexican writers and editors. For more information about this program click here. LEO AC is an association for promotion of literature which was created in 2013 in order to make reading available for boys and girls in vulnerable situations. The rapid growth of this association is thanks to the valuable team of volunteers, who are committed to the task of opening the world of books to the little ones and offering with it a path to empowerment, education, fun and knowledge. Throughout these five years we have worked with more than 200 children in homes and public schools, setting up two libraries in learning institutions of low income and linking our kids to different figures of the editorial and literary world, offering talks with writers, illustration workshops, music courses, literary creation courses and other activities. The Fundación Zorro Rojo was created as a space dedicated to literacy, for teaching children from marginal communities who are behind their age and school group in reading and writing skills, in order to close social, educational and economic gaps. It offers weekly workshops open to all, with children and adults discovering and sharing reading as a recreational, emotional and cultural activity. It also supports the community in order to reduce the digital gap by means of the use of technological resources and carries out applied educational research that contributes to improving our country’s educational conditions. Adriana Grimaldo at CASA HOGAR DE LA FUNDACIÓN JOSEFA VERGARA Y HERNÁNDEZ I.A.P. Adriana Grimaldo (Monclova, Coahuila, 1983) thinks that perhaps humanity’s best invention has been words. With them, we not only connect with the world, but we can share our interior world with others. Adriana Grimaldo loves and admires words: she speaks them, learns them, listens to them, reads them and writes them. She uses them to communicate with children and young readers through her novels: Valles y Alturas, De Noche and Viento Austral. In them she has written about the stages of life, in metaphors. As part of the Hay Festivalito activities, Adriana will start a conversation with the girls of the Casa Hogar de la Niña y la Juventud on Thursday September 6th. 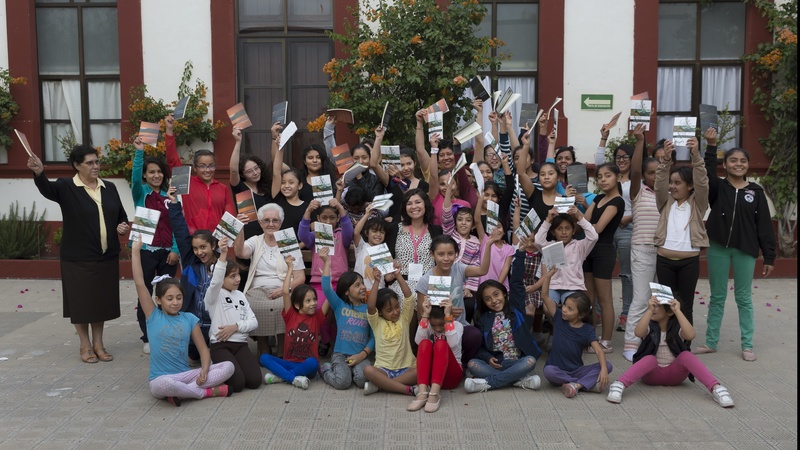 That day, each one will receive a book, according to their age, and from September to November, Adriana will continue to visit them to run the reading workshop and encourage a conversation about life that can help to imagine the world. For five years, Centro de Cultura Digital (the Digital Culture Centre) has been developing an editorial project focused on research and exploration of technology media in order to create literature. Its starting line is the fundamental question: how are the readers and the writers of the 21st century? Teamed up with E-literature editorial project of the CCD, the Hay Festival has a series of activities dedicated to reflect around literature expanded to a digital format, its relationship with machines, the figure of the author as a medium and machines as generators of textuality. Experts in digital literature, writers who are interested in digital practices or in the expanded ways to understand writing will speak about these aspects (which will be better understood with the exhibition Writing Machines, available these days in Galería Libertad) as well as a writing improvisation exercise lead by some of our guests, so they may interact with the public. The Universidad Autónoma de Nuevo León, through Cultura UANL, the “brand” of its Extension and Culture Department, bases its vision and mission on the notion of Culture as a set of knowledge, together with spiritual and material elements, which are transmitted from generation to generation and make up the identity of individuals and societies, an essential component for the integrated and sustainable development of individuals and peoples. Considering declarations and agreements by national and international organisations, Cultura UANL assumes that Culture also acquires different forms over time and throughout space, a variety of expressions that can be found in know-how, art, traditions and languages. This diversity is manifested in the originality and plurality of the identities that characterize the groups and societies that make up humanity, a source of exchange, innovation, creativity and everything that constitutes a communal heritage. The UANL – Hay Festival Alliance, which gives the UANL the opportunity to join and contribute to the dissemination of reading and literature. Cultura UNAM aims to support the dissemination and creation of the cultural and artistic expressions of all kinds, as well as the scientific, technological and humanistic knowledge, that have their source in the university. In order to do this, it builds links among parts of the university and with other national and international institutions in order to carry out joint cultural projects. At this Hay Festival, UNAM contributes activities that are in harmony with its original programme, with the goal of bringing the voices of international artists to the university community, promoting critical and aesthetic meaning by integrating art and culture into the lives of those who make up that community. Events with Latin American writers who belong to the Bogotá39 2017 selection, in the bilingual book shop The Wild Detectives and in different universities in the city of Dallas, Texas (USA), from the 6th to the 11th of September. The Hay Festival and the Wild Detectives book shop, with the support of the Mexican consulate in Dallas, the SMU, UTD and UTA universities and Aeroméxico, come together to celebrate the publication in English of the Bogotá39 anthology. For this event, we count on the presence of the following authors of the 2017 selection: Juan Cárdenas (Colombia), Gabriela Jauregui (Mexico), Brenda Lozano (Mexico), Emiliano Monge (Mexico), Mónica Ojeda (Ecuador), Eduardo Rabasa (Mexico), Daniel Saldaña París (Mexico) and Christina MacSweeney (UK), translator. This event, apart from celebrating, sharing and promoting the work of some of the best Latin American authors of under 40 years of age, will focus on themes related to gender, translation, and the relationship between Texas and the USA with Latin América. All of the activities will be bilingual and free. For more information about this project click here.